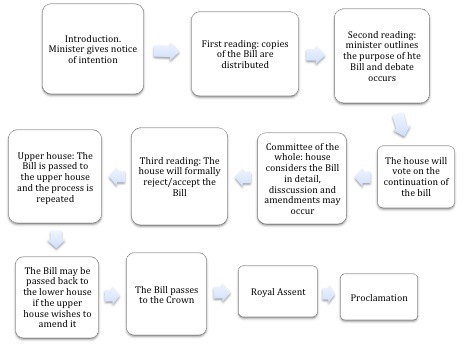 The legislative process refers to the steps that a proposed law (Bill) must go through in parliament before it can become law. Cabinet determines government policy, and ultimately presents its ideas in the form of a Bill to parliament. It also appoints a minister to be responsible for the Bill’s passage. The minister responsible for a Bill will brief the parliamentary counsel (draftsperson), who in turn is responsible for the public servants who will draft a Bill. The draftsperson will act on the advice of the responsible minister, frame the Bill broadly and ultimately submit it to the responsible minister. A minister gives his or her notice of intention to present the Bill to parliament, and will read the title of the Bill (generally to the lower house). Copies of the Bill are distributed to the lower house, and its contents are made known. However, no debate occurs at this stage. The minister responsible for the Bill will give a speech to the house outlining the Bill’s purpose. Following this, significant debate occurs wherein the opposition will present its views. Finally, a vote for continuation will occur. This stage is known as the ‘consideration in detail’ stage in lower houses, and the ‘committee of the whole’ stage in upper houses. It is an optional stage, which only occurs for particularly controversial Bills. The speaker of the house will step down, with his or her place taken by the chair of the committee. The house will examine the Bill in detail, clause by clause, and may make amendments to it. The third reading is usually a formality stage. The house will vote to formally accept or reject the Bill. The upper house repeats the process that has occurred in the lower house. If it makes amendments to the Bill, it requires the approval of the lower house. Having received a majority vote in both houses, the Bill is passed and presented to the Crown. Royal Assent is a stage wherein the Crown formally approves the Bill, and it can become law. The Bill is proclaimed in the Government Gazette, which outlines the day that the Act (passed law) will come into effect. If the Act or Government Gazette does not specify when the Act comes into effect, it will do so 28 days after Royal Assent is given.